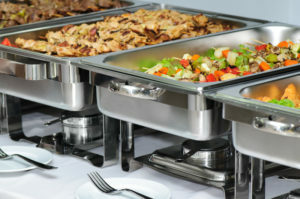 Restaurants and caterers typically purchase supplies in bulk to take advantage of significant cost savings and to be prepared during especially busy periods. But there’s obviously a limit to how much you can store in your restaurant at any one time. In this article, we’ll explore three self-storage tips for restaurants and caterers near Pittsburgh that could help you operate your business more efficiently and provide a better experience for customers. Tablecloths. Place settings. Candles. Silverware. Napkins. Aprons. Outdoor patio furniture. The list goes on. Obviously, you need this stuff, but it takes up valuable space in your restaurant. And, depending on how busy you are, you may need more or fewer of these items than you currently have. When restaurant traffic increases, you can obviously purchase more supplies and wait for it to arrive. But if you don’t have time to wait, you can stock up on the things you anticipate needing now and store the excess in a self-storage unit. This way, when you get busy, you can simply grab the items you need and put them into rotation immediately. Think about all of those trendy restaurants in the South Side. Café Du Jour, The Urban Tap, Doce Taqueria… they all do a great job providing customers with a fresh, clutter-free dining experience. You can do the same thing at your restaurant – without a trendy South Side budget. Create a seasonal “look” for your establishment and rotate it throughout the year. Your guests will love the change of pace, and you can store the decorations you aren’t using in a self-storage unit to free up space. When it comes to your wine list, customers love seeing their favorite labels alongside interesting new selections they haven’t tried. But, proper wine storage for restaurants requires special accommodations you may not have. Rather than a costly add-on to their current space, some Pittsburgh restaurants and caterers are using climate-controlled self-storage units to store and protect their investments. These units are maintained and insulated at 55ºF with 50% humidity to ensure proper wine-maturity as well as cork, box, and label protection. If it’s your first time using self-storage, our experts are standing by to help you find a solution that is right for you. Find a self-storage location near you and request a unit today!